Jaleb Chowk – It’s the first of the four courtyards of the Amber Fort Palace designed as a parade ground which now houses a Shila Devi temple. Designed for protection, Jaleb chowk had only two entry points – the Suraj Pol and the Chand Pol. The wall connecting the two Pols served as the living quarters of the soldiers and guards of the fort. Suraj means sun in Hindi, hence the Suraj Pol faces east and pays homage to the rising sun. Entry through this gate was normally reserved only for the King. Diwan-e-Aam – The main components of the second courtyard are the Diwan-i- Aam (common in Mughal structures), the arcaded hall and the Ganesh Pol. Diwan-i- Aam is the “Hall of Public Audience” built in the mid-1620s by Mirza Raja Jai Singh I. This was where the Raja and nobles interacted with their subjects. In addition to addressing problems faced by the residents of Amber city, this platform came alive with music and dance on religious festivals and special occasions, like the Raja’s birthday and victory celebrations. Ganesh Pol – The Ganesh Pol is the large entrance that separates the private and public domains of the Amber Palace. The public was not allowed entry beyond this point. The grand gateway is covered in intricate fresco paintings; the depiction of floral motifs have been adopted from the Persian paintings and are again a marker of Mughal influence. Suhag Mandir – Tradition was very clear about elite women not being seen outside a very small group of people. Therefore, they were confined to a part of their palace residences demarcated as the Zenana with rather limited access to other areas of the palace. The Suhag Mandir was one such space outside the Zenana that they could visit. In addition to praying for their king and showering flower petals at him when he returned home through the Ganesh Pol, the Suhag Mandir doubled up as a window, quite literally, into the outside world. The rectangular chamber has one wall made up of three large ceiling to floor latticed windows called Jaalis. The Suhag Mandir is situated above the Ganesh Pol, and allowed women to watch the events taking place in the courtyard and the Diwan-i- Aam without being seen themselves. Jai Mandir or Sheesh Mahal – Jai Mandir is made from creamy marble, and with delicate designs inlayed in the walls and ceilings with Belgian glass. Hence, it is also known as Sheesh Mahal. It is visually distinct from the rest of the fort that is decorated with bright coloured paintings on the walls. 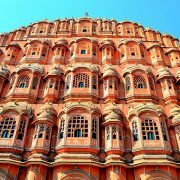 Built by Maharaja Jai Singh II in 1932 and expanded in later years, the City Palace occupies almost a seventh of Jaipur’s old city area. 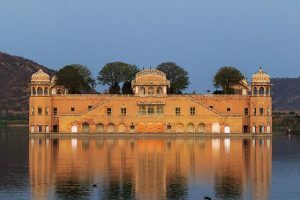 Constructed as a blend of Mughal and traditional Rajput architecture, the Palace is a huge complex of courtyards, gardens and a number of buildings including the famous Chandra Mahal and Mubarak Mahal. Chandra Mahal – A seven storeyed building where the descendants of the royal family still reside, this houses some of the finest paintings, floral decorations and mirror work -only ground floor is accessible to general public. 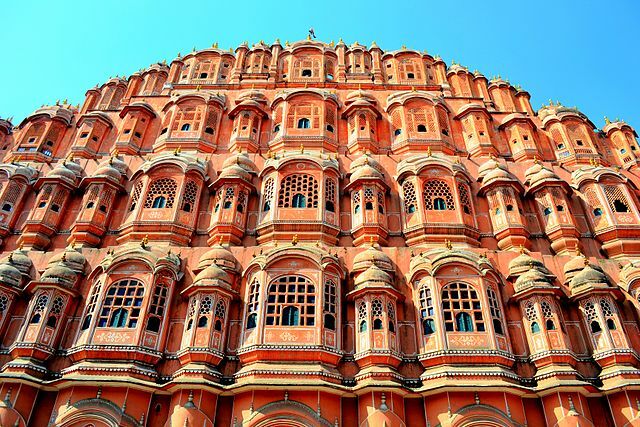 Mubarak Mahal – Originally built as a reception centre for visiting dignitaries by Maharaja Madho Singh II, this currently houses a rich collection of garments in a variety of textiles worn by the Maharajas of Jaipur – ranging from Sanganeri Block Prints to stunning Kashmiri Pashminas. Diwan-i-Aam has a collection of manuscripts including as miniature copies which can easily be hidden from invading armies. Diwan-i-Khas is famous for the two sterling silver vessels, 1.6m in height and considered largest in the world. These were used to take water from the Holy Ganga for the 1902 coronation of England’s Edward VII. Located on Badi Chaupad intersection, very close to the City Palace. 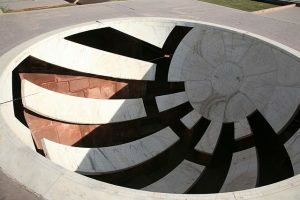 The name Jantar Mantar is derived from the Sanskrit terms ‘Yantra’ and ‘Mantra’ meaning ‘instruments or machine’ and ‘calculate’ respectively. This is the largest of five astronomical observatories built by Maharaja Jai Singh during the period 1727-1734. It has 14 major geometric devices for measuring time, tracking constellations, observing orbits around the sun and determining the celestial altitudes. While the accuracy of the structures here is questionable, it is still used by local astronomers to make predictions for farmers. Overlooking the city, Nahargarh Fort located at the edge of the Aravalli hills, offers spectacular views of Jaipur. 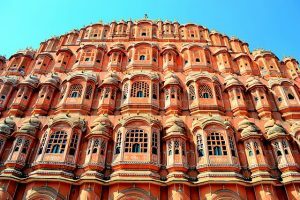 Built by the founder of Jaipur, Maharaja Sawai Jai Singh II in 1734, the fort served as a summer retreat while also helping strengthen the city’s defense with its extended wall connecting to the Jaigarh fort. Don’t forget to take a look at Madhavendra Bhavan built by Sawai Madho Singh, which has suites built for the wives and children along with a majestic suite for the king himself. Built in the 16th century, Panna Meena ka Kund, or Panna Mian Ki Baoli, is an eight storey staircase pool. The uniquely designed stairs are arranged as criss-cross steps with small niches in the walls. The stepwell served the dual purpose of a water source and a community gathering area, where people would come to swim and relax. 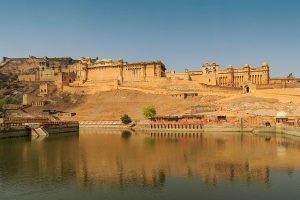 It also provides a picturesque view of the Amber Fort & Palace and mountains.